My current straighteners are a good 10 years old. 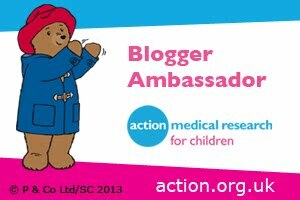 Since becoming a parent they have very little use as I often find I don’t have the energy or inclination to bother straightening my hair. 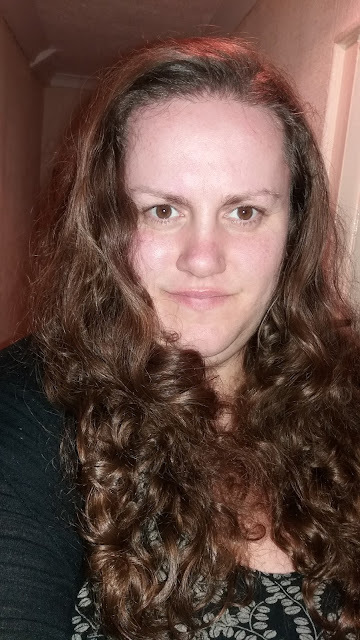 When I do manage to use them to tame my hair I love the result and find once straightened my hair is a lot easier to style…..yay for less knots and frizz! Whilst I love the result of straightening my hair, more often than not I don’t straighten it and tend to stick with a messy bun or quick messy plait just to get my hair up and out of the way. As I have recently vowed to myself to put more time and effort into ‘me’, taking time for pampering and actually buying myself new clothes once in awhile I also want to make more of an effort with my hair. Pre-kids I used to go to the hairdressers regularly, I dyed my hair and styled it daily but now I tend to only give my hair a little trim myself, never dye it anymore and rarely bother styling or straightening it. My hair tends to be wavy, curly with a lot of frizz. When it is given some TLC and styled I love it curly, likewise I love it straightened. But more often than not it is left wild and not given the attention it needs. 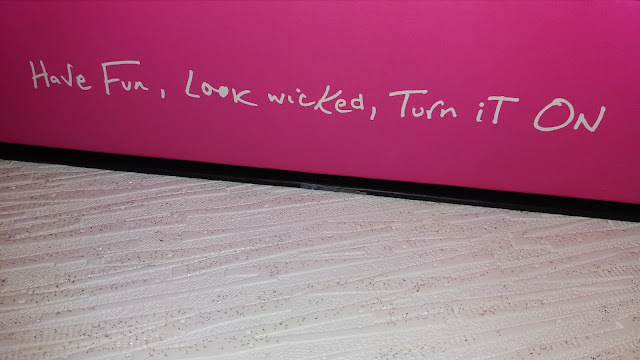 As I have only ever really used my well-known pink straighteners which are rather old I was excited about trying out a new brand of straighteners. 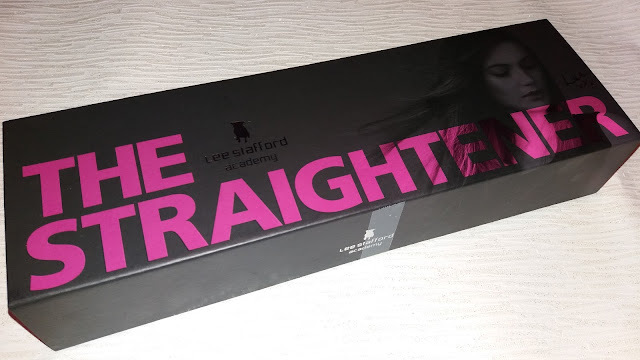 Designed and created by renowned hairdresser Lee Stafford the Academy Ionic Flat Iron Hair Straightener are described as being the most advanced flat iron hair straighteners on the market. 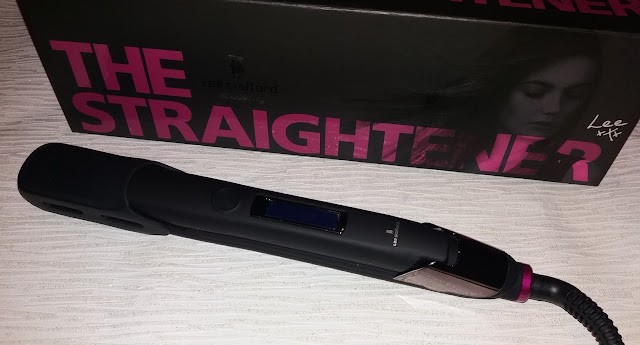 The straighteners arrived in a durable, sleek black and hot pink box that creates an air of luxury, high quality and style. The box features words from the man himself along with a stylish chic portrait photograph of him. 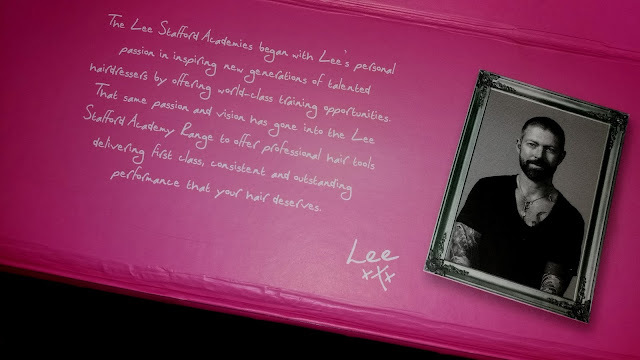 The box also features empowering words and messages from Lee that instills self-confidence and makes you feel special as if the straighteners and messages are personal to you. In the fab little hot pink envelope addressed ‘to the new you’ (love this!) 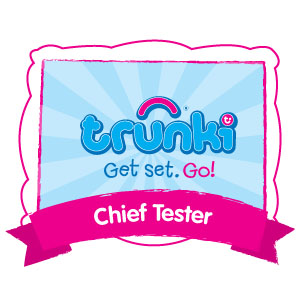 is a card that gives you tips on how to straighten or curl your hair. The hair straighteners are stylishly designed and created using superior materials which give them an air of luxury and quality. The nano silver titanium plates glide effortlessly along my hair and leaves my once curly and frizzy hair silky smooth and straight. The straighteners also boast the added benefit of using ionic function technology which allows the straightener to generate negative ions and make hair frizz-free. The straighteners are easy and lightweight to hold and thanks to sleek matte black finish with grips points they provide optimum grip whilst styling. 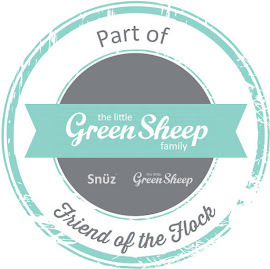 For safety and to protect the straighteners and plates when not in use they come with a silicone heat protection guard. They also come with 5 year manufacturer’s warranty. The straighteners also come with a long power cable which helps make using them easy and convenient. 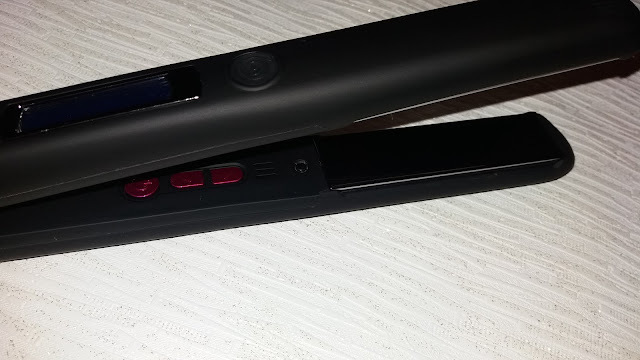 I love design of the matte black straighteners with luxurious detailing such as the rose pink gun metal, shiny silver plates and hot pink buttons for the power and heat settings. 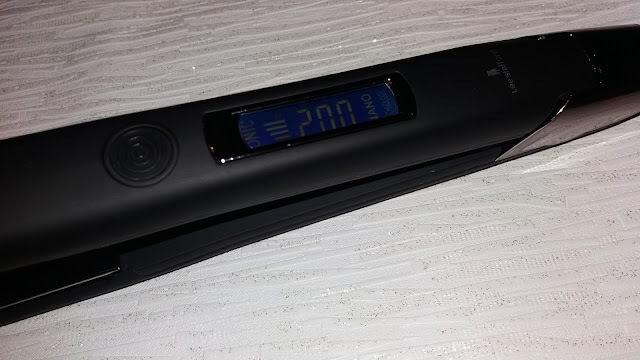 Thanks to advanced technology the sleek straighteners provide ultra fast variable heating (80-230° celsius). In just 10 seconds the straighteners heat up to the required temperature and thanks to the variable heat selection you can choose the best temperature for your hair type. 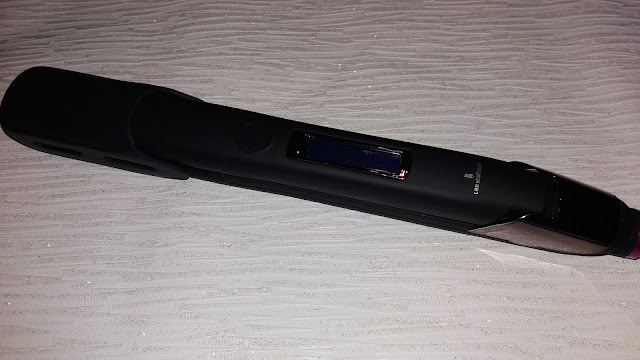 You can see the temperature of the straighteners on the digital window at the top of the straighteners, which changes as the temperature does and illuminates blue making it even easier to view the temperature. Adjusting the temperature is quick and easy using the plus and minus buttons. I really like how quick the straighteners heat up and how you can adjust the heat setting to suit your hair type making it kinder on varying hair types. 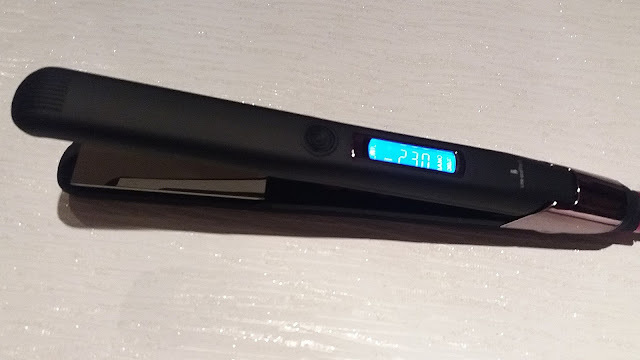 Using the straighteners to tame my frizzy, long hair I was delightfully surprised that they quickly straightened my hair leaving it smooth and silky to the touch. As I have long hair that is a mix of wavy and curly, normally when I straighten my hair it is a mammoth task that takes a long time (45+ minutes) but with the Lee Stafford Academy Ionic Iron Flat Straighteners I manage to straighten my hair quickly in a little under 15 minutes! 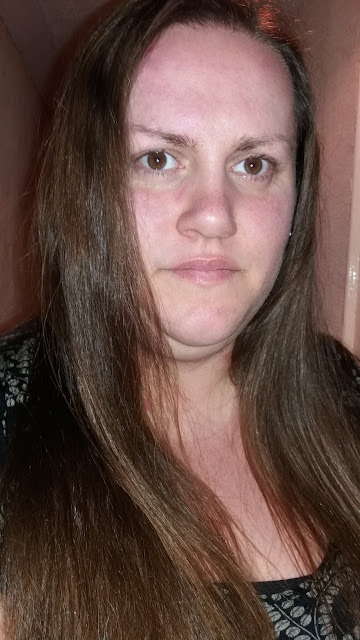 As a parent with limited ‘me’ time but wanting to make more of an effort with how I look these straighteners are a lifesaver and how quick they straighten and smooth my hair is truly splendid. Now all I need is for Lee Stafford to pay me a little visit and give my hair a makeover and brand new style. The Lee Stafford Academy Ionic Flat Iron Straighteners are available at all good retailers including Amazon.